While the excitement of the World Cup in Russia keeps many of us fixed on the merits of the contending teams and the drama of the games, the news out of Brussels is disturbing. They’re preparing for war. With Russia. There is no other way to read what Jans Stoltenberg (see featured image) announced at a press conference in Washington on June 6, the anniversary of the D-Day landings in northern France by British, Canadian, Free French and US forces, to attempt to stop the Red Army from the complete capture of Germany in 1945. Just as those allies had to clear the German Army from their path then in order to face off with the Red Army, today they are intent on clearing the path for the rapid movement of men and material across the Atlantic from the USA to Europe and rapid and easy movement of those forces across Europe to the east, to not just face the Russians but to attack them. Operation Barbarossa II, the name I use for this operation, though I am sure they have their own, the set-up for which has been proceeding for several years, is building momentum with the announcement by the NATO defence ministers of the establishment of two new NATO joint force commands: one in Norfolk, Virginia, a US naval base, and one in Ulm, Germany. The Norfolk joint command will manage the logistics for movement of troops and materiel from the USA to Europe as rapidly and smoothly as possible, while the Ulm command will ensure the movement of those troops and materiel continues without obstacles across Europe to the Russian border. The establishment of these new commands is not defensive, which is their claim. They are offensive and are part of the larger conspiracy among the NATO governments to commit the crime of aggression against Russia. on Russian territory and an important military base on the Baltic Sea. Just imagine, Russia dares to have nuclear weapons based on its own territory, and is treated once again as a pariah. Then try to imagine the western press being exercised in the same way about the US storing nuclear weapons in many bases on its territory as well as other countries around the world, and you can begin to wonder what all the fuss is about; especially when North Korea just won from the United States the concession of the discontinuance of the constant threat of joint US-South Korean military exercises for agreeing to talk about disarming its nuclear defence system in the hope of guarantees against American aggression and a peace treaty. We have gone down this road before and we hope for the best, but US treachery is notorious, as we have seen before regarding promises made to North Korea and recently to Iran. So as the USA signals some relief of pressure on the North Korean front, it elevates the pressure elsewhere like a player on the Wurlitzer organ of war, pulling out the stops on the organ pipes there, and pushing them in there as they try to direct the world into its traps. Even its “allies” are being given the rough treatment, with Canada being picked on as an example to the rest, that any opposition to American wishes will not be tolerated. All that the Canadian prime minister did, at the end of the G7 meeting in Quebec, was to reject the American President’s claims about free trade and tariffs and to state that Canada would not be pushed around. Shocked that anyone could dare say such a thing to him, the American president stated, in effect, that no one can talk back to him, that he is emperor and must be obeyed and if you try disobey you will be crushed. ‘It’s gonna cost yuh.” The world history is littered with such tyrants and such tyrannies, and in the end they all lose their heads in revolution or war, but in the meantime they oppress us with impunity. The American economy is in a bad state, with national debt that renders it in fact bankrupt, an economy that is stagnant, with 45% of the population living in poverty and millions more on the edge, a real rate of unemployment of at least 21%, its primary industry declining, its ability to sell its goods in competition with the rest of the world weakening while its military spending wastes most of the national budget on long, unwinnable wars. So, to try to make the country “great again,” the Americans have decided to beggar their neighbours, their allies and everyone else, by forcing them to buy more American products and sell less of theirs, using tariffs as the gun to the head. But though there are increasing tensions between the members of the NATO cabal as they fall out over who is going to make the most money among them and even talking about war, they are united in their continuing hostility towards Russia. 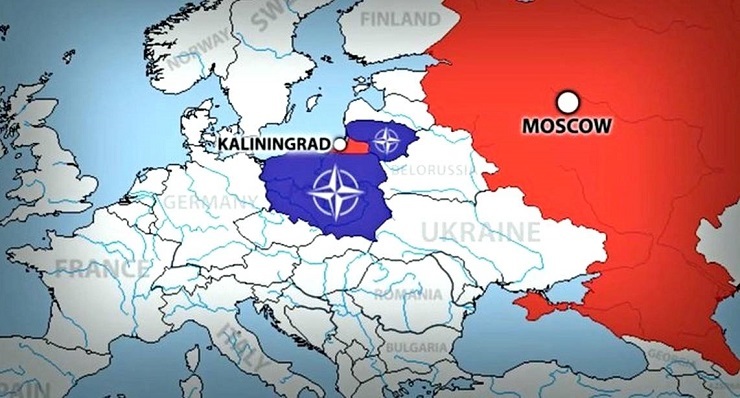 This writer has expected the hue and cry regarding Kaliningrad for some time because, on Friday, February 26, 2016 the Atlantic Council, the preeminent NATO think tank, issued a report on the state of readiness of the NATO alliance to fight and win a war with Russia. The focus of the report is on the Baltic states. The report is called “Alliance at Risk”. It has the sub-heading “Strengthening European Defence in an Age of Turbulence and Competition.” Layer upon layer of distortion, half-truths, lies and fantasies obscure the fact that it is the NATO countries that have caused the turbulence from the Middle East to Ukraine. NATO is responsible for nothing according to this report, except “protecting the peace.” Russia is the supreme aggressor state, intent on undermining the security of Europe, even intent on attacking Europe, an “existential threat” that NATO must prepare to repel. The document also uses language that indicates that the NATO powers do not recognize Russian sovereignty over Kaliningrad that was established at the end of the second world war, claiming that Russia “has ripped up” the post-Cold War settlement of Europe, whatever that means to them because, as far as we know, the Cold War was supposed to end with the withdrawal of the Red Army from Eastern Europe in exchange for a commitment by USA that NATO would not move east. Instead the NATO powers, with the treachery that is their custom, moved quickly into those territories and began conducting regular and expanding military exercises threatening Russia directly. The false concern about the type of arms that Russia may or may not have at their base in Kaliningrad is designed to raise the issue in the public mind and to manipulate people into calling for action to be taken to remove this “threat” to NATO before it is too late. It’s the old “weapons of mass destruction” rationale all over again, we’ve got them, and that’s just fine, but they’ve got them and that we can’t allow. But the real reason is that they want to start something. They have tried in Britain with the Skripal affair but the credibility of the British claims has been questioned even by its allies, in particular Germany, which stated that apart from British claims, it has seen no evidence at all that Russia was involved. They have tried it in Syria with staged chemical weapons attacks, supported by NATO propaganda units masquerading as non-governmental organisations. Now we can expect a build up of propaganda around the Russian base at Kaliningrad, and a false flag operation by NATO against their forces in the area in Poland or the Baltic nations or the peoples there to be blamed on Russia resulting in calls for Russia to surrender their position there or to justify an attack on it. This of course is exactly in line with the demands of the Alliance At Risk Report that called for a NATO force to be placed in Poland, and this staged alarm concerning the possible nuclear weapons at Kaliningrad will serve as an added justification for placing NATO forces in Poland directly on the Russian border and will increase the existential threat against Russia.